As China unseats the US as the largest smartphone market in the world, the proportion of app revenues and free downloads originating from non-English language apps has increased significantly. Of course, other high-growth non-English countries have had an impact on this trend, but Chinese smartphone users remain the most sensitive to app language. In a Distimo report from September 2012, 73% of free downloads in the top 200 most downloaded free applications in China were those supported by the Chinese language, far outstripping the other language-sensitive markets of Korea and Japan. In fact, China is the only country where local language apps generate more downloads than English apps. The true case to be made for app localization, however, rests on the fact that revenues from Chinese-language apps far outstrip those from English-language apps in China. Developers can grow their revenues and realize positive returns on investing in translating their app into Chinese language, and optimizing the product feature set for Chinese consumers. 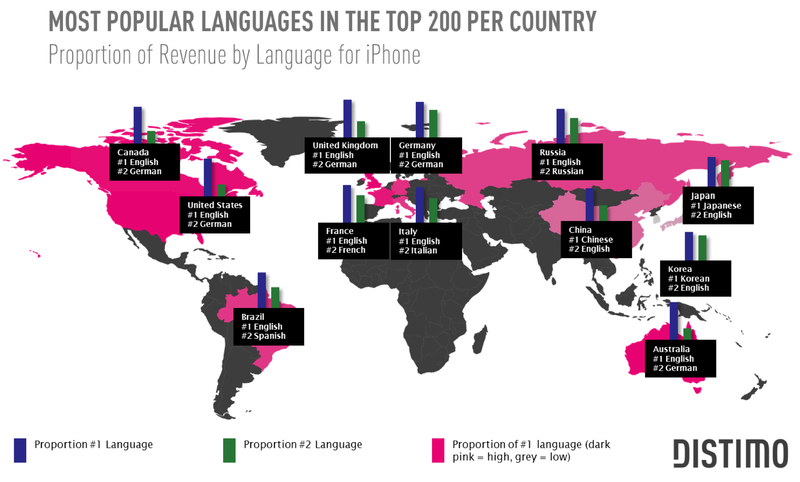 China is not the only country where the proportion of app revenues generated from local-language apps are higher than those from English apps; the Korean and Japanese are similar in this respect—though to a lesser degree than China. The Distimo report only accounts for iOS apps running on relatively expensive devices; the iPhone and iPad. The data reflects a market segment of Chinese consumers characterized by a high level of discretionary spending on consumer goods. This segment is also more likely to have some knowledge of English language, more likely to have exposure to foreign products, and thus less likely to have a strong preference for Chinese-language apps. In contrast, Android users in China generally represent a market segment which is less likely to have a working knowledge of English or exposure to foreign products, and so more likely to have a strong preference for Chinese language apps. For these reasons, we can expect that the proportion of downloads and revenues generated from Chinese language Android apps in China to be even greater than for iOS apps. Overview: Since Kang’s previous app had already been in the app store for a while before he started ASO, it’s rankings were being affected by more than just keyword data. In order to isolate these factors, Kang recently uploaded a new free version of his app. After one week of submission to the China Apple App Store, Kang’s new app had not broken into the Top 100 for the keyword ‘print’. After ASO, the app now ranks #11. Thanks to Mr. Kang for sharing, you can read more about his full experience (in Chinese) here. 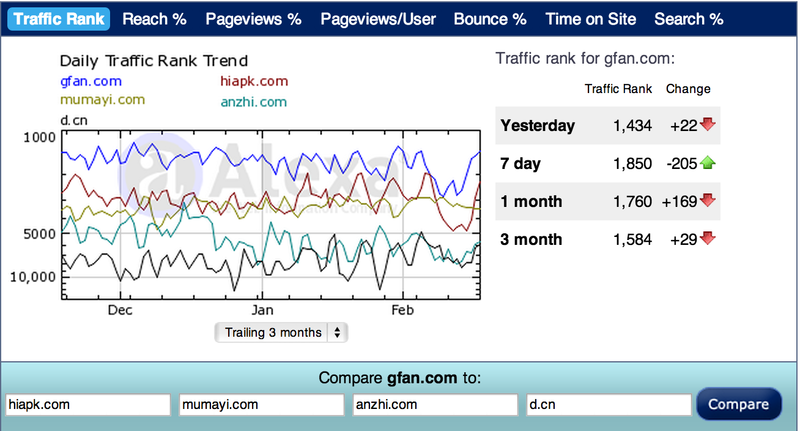 GFan.com emerges as the highest-ranking of the top 5 for traffic (3 months trailing). Closely following GFan are HiAPK.com and Mumayi.com. 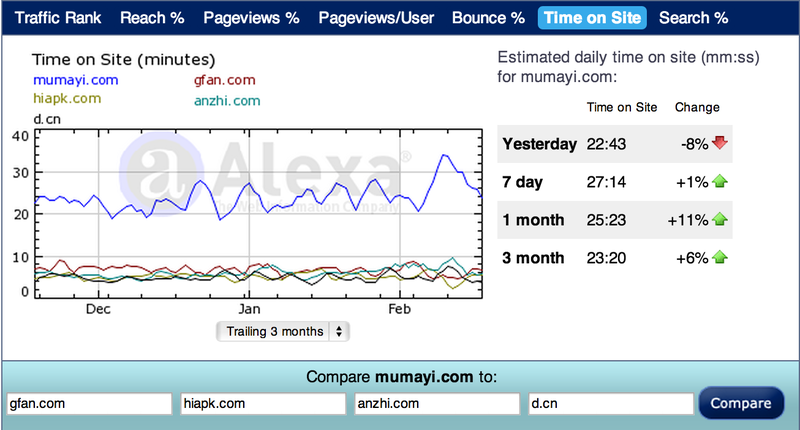 Anzhi.com follows after that, with game specialist D.cn ranking lowest of the top five. The five all share similar audience demographics—single, young adult Chinese males with a college education browsing from school or work—and are all driving traffic primarily from Baidu, Google, QQ and Weibo. More importantly, all five have very active discussion groups and app user communities, serving as invaluable marketing channels to launch word-of-mouth campaigns and drive installs. 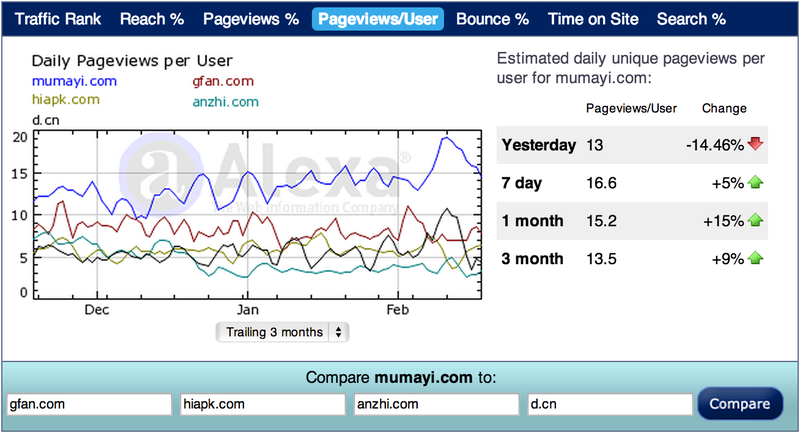 #1 – GFan.com claims more than 90,000 apps and 15 million registered users. In 2012, the platform entered into a partnership with US-based Tapjoy, an app cross-promotion platform that was previously slammed by Apple for degrading the usability of apps running on iOS. The path to monetization offered by the GFan/Tapjoy “incentivized freemium zone” is a strong example of a product feature that might irk US smartphone users to the point of abandonment, but that Chinese users will tolerate in exchange for not having to register a credit card number. Look out for more GFan partnerships with developers and monetization platforms in the future. #2 – HiAPK.com although there have been rumors of unorthodox user acquisition methods, namely through paying grey-market hardware vendors to pre-install their software onto devices imported into China, the platform has impressive traffic that cannot be overlooked. Although the URL is pretty cryptic to the layman, the the platform is branded as 安卓网, best translated as AndroidNet, so it does pretty well targeting new users looking to get some info and app suggestions for their Android device, namely through Baidu and Google’s Chinese search engine results. Mumayi’s ability to engage visitor’s for longer and to view more pages is in large part due to a superior UX: the portal has an excellent layout for app reviews and solid app suggestion tools which are based on the app review a visitor is currently viewing. App marketers seeking to get the most downloads out of Mumayi’s traffic would be wise to research Mumayi’s app categories and relationships so that their app appears more frequently in front of targeted users. 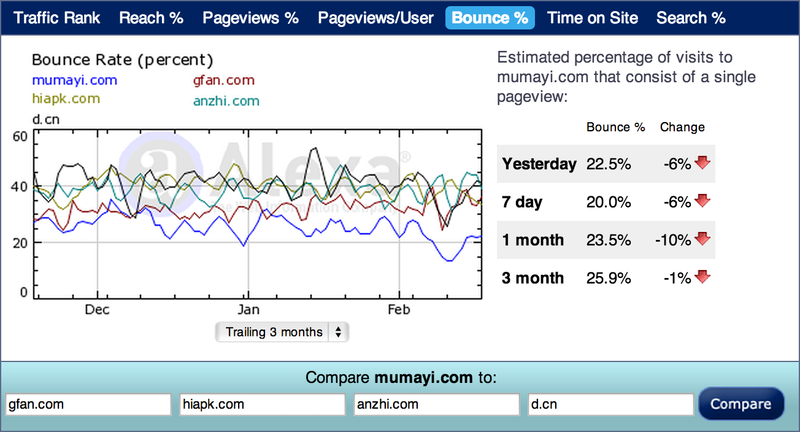 Shanda-backed Anzhi has seen a downward trend in traffic over the past 6 months. 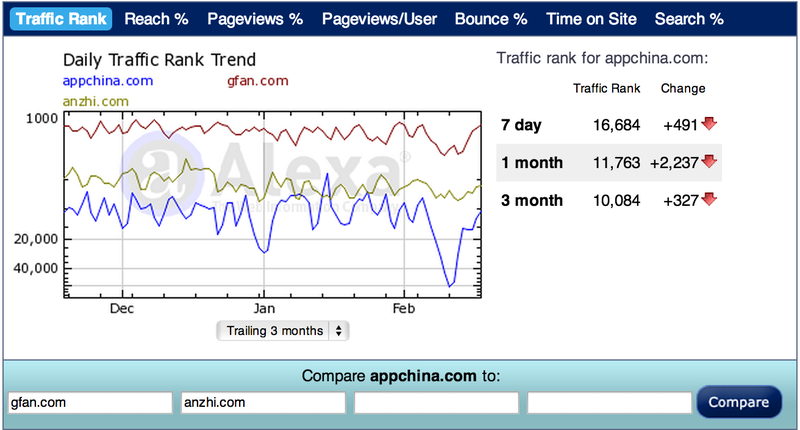 Nevertheless, as the 4th most trafficked China app market for Android, Anzhi cannot be overlooked. #5 – D.cn offers a range of apps, but mostly focuses on games. In 2011, they won the right as China’s exclusive distributor for Rovio’s Angry Birds. After a quick scan over some search query data, my rough estimate is that DangLe generates about 25% of it’s search engine traffic from game-related keywords like ‘temple run’, ‘android games’, ‘angry birds’ and their Chinese-language equivalents. To sum up DangLe, it’s a must for game-focused app developers, and a worthy consideration for ‘foreign-branded’ apps that offer game-like content. Most importantly, AppChina has an advantage in the emerging mobile ecosystem by way of close relationships with Innovation Work’s other ventures such as WanDouJia, an app portal that offers a very popular (claims of 10 million registered users) cloud-to-desktop syncing app. Together, AppChina and WanDouJia have managed to secure first-mover rights for the new Chinese version of Flipboard. Inaugural Post – China App Market: Siren’s Song or a Mere Mt. Everest? With 150 million smartphones by end of year, 5.5 billion downloads, and double-digit growth in app and mobile ad sales, the China app market appears to be a gold-laden opportunity for iOS and Android developers operating anywhere in the world. The proliferation of 700,000 apps combined with slower absolute growth in smartphone adoption has made the US and Euro markets increasingly competitive. 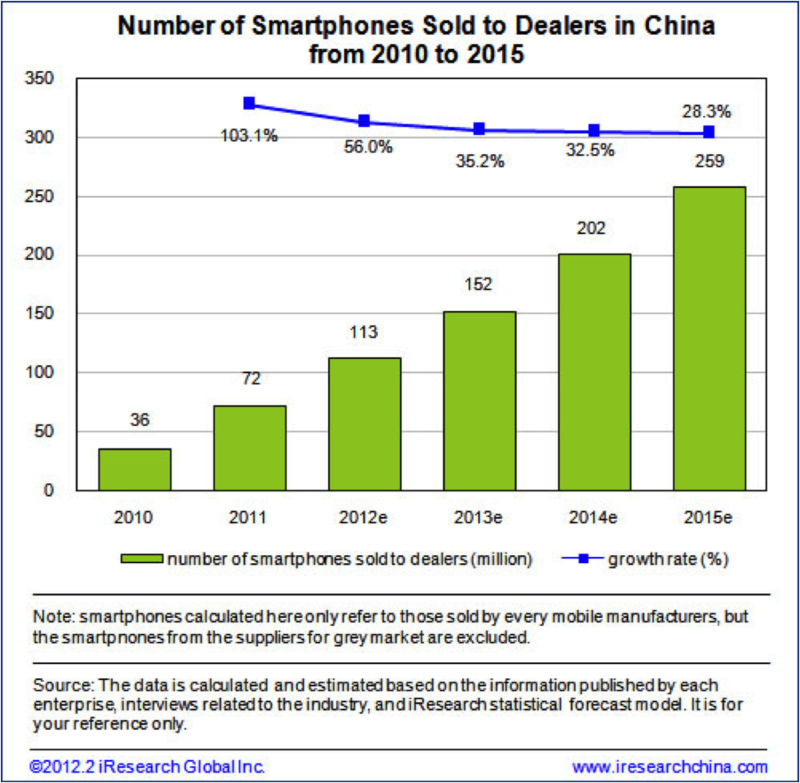 Developers and mobile marketers can no longer afford to ignore the China opportunity . Of the estimated 60 million iOS devices operating in China, only 10 million have a registered account on the Apple App Store with a credit card attached. More than 50% of those devices are jail broken, giving leverage and market share to third-party iOS app markets. Between these independent markets, 8% of Apple App Store paid apps—about ~20,000 apps—are found in pirated (and usually free) form. Because Apple’s China App Store does not require a credit card to create an account, shuabang companies have emerged to sell installs and user ratings’ to the highest bidders. Of the 140 million Android devices operating in China, less than 10% are registered with Google Play, the official Android app store. This is in large part because Google has made a strategic decision to not release a China version of Google Play. The result has been an explosion of third-party Android app stores, with dozens in existence today. Whether iOS or Android, Chinese mobile users’ show a large preference for Chinese-language products. Close to 50% of the Top 25 most downloaded apps in China have Chinese-language names. The majority of popular apps in Asia—such as Dianping, QQ Messenger, Weixin, PPS and others, are only popular in Asia, emphasizing the importance of app localization. 1) A fragmented and opaque aggregate app market, especially for Android. 2) A strong preference for Chinese-language apps and marketing channels. 3) Chinese users’ reluctance to pay for mobile products and services. By innovating marketing and monetization strategies that play to the set of marketing channels and consumer behavior unique to China, foreign developers and mobile app companies can overcome these challenges.